These plants will produce in excess of 350,000 short tons per year of straight and coiled rebar products in sizes, grades and custom lengths to fulfill the most demanding construction applications. The mills will allow Nucor to be the low-cost producer in those two areas, exploiting the abundant scrap supply and the logistical advantage over other domestic producers supplying rebar from outside the region. “This rebar MI.DA. 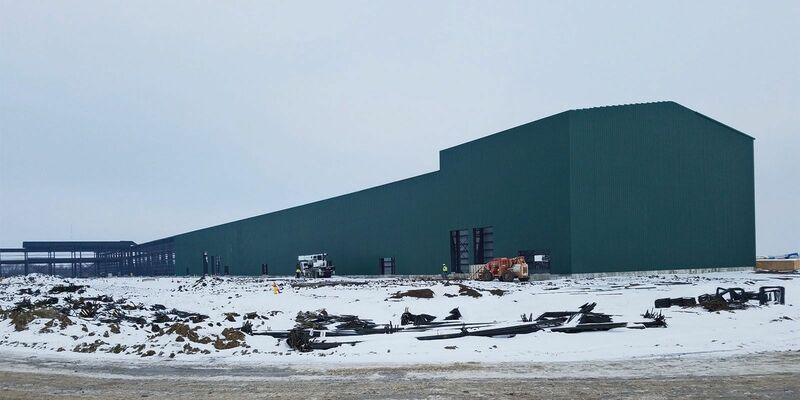 project is consistent with our long-term strategy for profitable growth and builds on our position as a low-cost producer,” said John Ferriola, Chairman, CEO and President of Nucor. At each new plant, a Danieli ECS® continuous scrap-charging preheating system will feed a 40-t, side-charge AC EAF and a ladle treatment furnace. The core of the endless casting and rolling section will include a single-strand, high-speed continuous casting machine featuring the latest design of PowerMould and FastCast Cube oscillator, directly connected to the 16-stand rolling mill for uninterrupted production cycle. The finishing end will include the innovative DRB-Direct Rolling & Bundling system for production of superior-quality bar bundles and the latest Danieli K-Spool lines producing twist-free, perfectly shaped, compact bars in coils. Currently, the Sedalia project is under construction, whilst the equipment for Frostproof is under manufacturing. The mills will be in operation in late 2019 and early 2020, respectively.